Frederique Molay is a new (to me) French writer. She has written five books, of which three are in a series called 'Paris Homicide', and are the only ones so far, to have been translated into English. 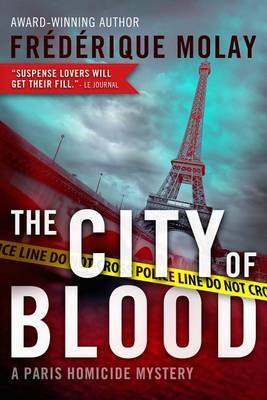 CITY OF BLOOD is the third book in this series. The Paris Homicide series feature Paris's top criminal investigation division, led by Chief of Police, Nico Sirsky. The story starts with the excavation of a buried feast, a Tableau Piège, in the Parc de la Villette, Paris. La Villette is the former site of the old Parisian slaughterhouses 'Cité du Sang', only closed in 1974, and made into a park by President Mitterand. The Tableau Piège was designed and constructed by a French artist, Samuel Cassian, of the 'new realist' school. Interestingly, this type of artwork is typical of the artist Daniel Spoerri, a Swiss artist and writer, and also known as 'snare-pictures'. In the novel, the artwork consists of the remains of a meal, a final banquet for 120 guests, in which everything including the plates, cutlery, glasses and leftovers were buried, with the plan of digging up the remains years later. But as the excavation starts, there is the unwelcome surprise finding of a corpse. A suicidal guest? Victim of an accident? Or a murder victim? With not much more than an old watch to help identify the victim, the police, led by Nico Sirsky, quickly determine that the body is that of Cassian's son, who disappeared thirty years ago. An artist like his father, Mrs Cassian still talks about him, as if he were alive. His room in their apartment remains untouched since he left, and she seems to believe that he emigrated to New York. Then, shortly after the body is found, there is an attack on a young man in the park. He is found dead, and a large square of muscle has been cut out of his back and shoulder. Shortly afterwards another victim is found in a nearby hotel room, and again a square of muscle has been removed. Meanwhile, Nico's mother has a heart attack, and is rushed to hospital where she faces a dangerous operation to stabilise her heart. Nico makes a bargain, his mother's life will be saved if he manages to find the murderer. This is a relatively short book, with an interesting plot. There is an interesting juxtaposition of Nico's search for a murderer, and his fears and concerns about his mother bundled in with descriptions of his home life, and family. Nico is not the archetypal driven cop with dysfunctional relationships, and this makes for a refreshing change. The key to solving the murders is to delve back thirty years, investigate Jean-Baptiste's life, find out what, if anything, he was hiding, and determine if anyone had a motive to kill him. Slowly Nico starts to make headway, but can he discover the murderer in time to make good on his bargain? With a little bit about art, and the history of Paris thrown in, this was an intelligent read that I particularly enjoyed, and will be looking out for the previous two books in this series.